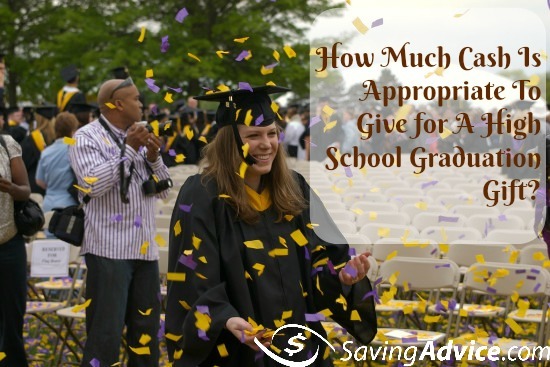 One of the most popular questions on SavingAdvice this time of year is how much cash should one give a high school student for graduation. There are a lot of variables which need to be taken into account, but there seems to be a basic consensus that the appropriate amount of cash to give depends on how close the person is to you. The general rule is the closer the person is to your family, the more the cash gift should be. When you receive an announcement in the mail that someone is graduating from high school, it’s important to remember an announcement is not the same as an invitation. There is no obligation to send the graduate cash or a gift unless you want to (a congratulations card or small gift will suffice). If you do decide to give something in this situation, cash or similar in the $20 – $30 range is appropriate. Unlike a graduation announcement, it’s considered good manners to give a gift to the person graduating when receiving an invitation to a high school graduation whether you attend or not. Again, it depends on how close you are to the person, but a cash gift in the $20 – $50 range is usually appropriate. If you have received an invitation from a distant relative to attend a graduation ceremony, a cash gift in the $50 range is appropriate. For those who are close to you and graduating from high school, a cash gift in the range of $50 – $100 is most often appropriate. If the person is part of your immediate family, the gift should be appropriate to what your family does in gift giving situations. Should I Give A High School Graduate Cash? What is the best gift to give a high school student graduating? In general, if you don’t know the person well, you can stick with cash, a check or a gift card. There are other great graduation gift options as well. A gift is appropriate if you know the student well and know what he or she would like, but for those who are in doubt, it’s best to stick with money. What Should Graduates Who Receive Money Do? For those on the receiving side of cash or gifts for graduation, it’s appropriate to send a hand-written thank you card for each gift you receive. Even in this day and age of computers, it’s still not considered appropriate to send a thank you by email or text message. I always give $50 to cousins and son’s and daughters of close friends. It seems to be in the middle which I’m fine with. It can be an expensive time of the year if you have a lot of the kids graduating which seems to be happening more and more. Unless you know the graduate really, really well, give cash (or the equivalent). It gives them a chance to spend it on what they want or need. This year, my Son graduates from High School, so we have A LOT of graduation party invites. I have decided to by each boy (boys school) a sweatshirt from their new school/university. I am trying to spend about $50 on each, but felt it would be a more personal touch! If your child is also a graduate and gets invited to others graduation parties alone (i.e. our whole family does not get invited), is it appropriate for him to bring a gift? If so, how much? (If our whole family gets invited it is likely a close friend and I usually give $50 or so). Good article. I think that you can buy a good graduation gift for under $50.Most of the product I look into aren’t costly. My daughter will be graduating in June 2019.from 8th grade she worked so hard as her mom i will be giving her about 250.00 in cash.